The Kobo Vox was officially released today and at Good e-Reader we have filmed our own in-house review and comparisons vs. other e-readers, such as the Nook Color. We had plenty of time to experiment with the device and have compiled a fully featured application list you can download right to your device. The Kobo Vox has the ability to load in your own books, pictures, video, and applications. By default it comes with the GetJar app market, with over 15,000 apps. I found that it severely lacked in some content you would want, such as a good file manager. The Vox does come bundled with plenty of apps to get you reading right away, but what about Amazon, Barnes and Noble, Aldiko, or Droid Comic Viewer? We installed all of these applications without any problems on our review unit. You can also install alternative market places such as Amazon App Store, Andappstore, and many others. We found that the official Google Android Market is NOT supported. Most of these download links come from the official websites or our own servers. You can use the Kobo Vox Web Browser to download all of these applications right to your device. Once they’re downloaded, you can pull down the top menu by swiping downwards. This will show you all of your recent downloads. You can click on the dedicated application and install it. If you have not authored your Kobo Vox to install 3rd party applications you will be re-directed to your settings menu so you can enable apps from unknown sources. Remember, the Kobo Vox is an open Android Tablet. Most Android apps will work with the current Android 2.3 operating system that it ships with. Update November 3rd 2011: We have added lots more applications to this list. That is our list of essential applications for your Kobo Vox Reader and Tablet. If you have any requests for us to post that are legal to download let us know, and we will post them for you. We have created a new Android App Store specifically for the Kobo Vox and Kindle Fire!! All of the apps are certified by us and put an emphasis on the apps listed here! Check it out at http://goodereader.com/apps/ You can also download the new APP CLIENT which automatically installs and updates all Android e-reading apps, games, comic book readers and tons more! Download the client HERE. In getjar, if I set the device to ‘kobo vox’ I can’t find google books, world newspapers or even overdirve for download of library books. Disappointing however before I make any final decisions about purchase I’ll have to run a few more tests. I’m new at this all, so does this mean you are limited on the apps you can get on the vox? I can’t get the Adobe Digital editions software to see the Vox as a device. to authorise the device in Adobe. The main limitation is your can’t install the official Android market, but really any other app downloaded will work. Adobe prob has not patched digital editions yet for support. They may do this soon because all of the other devices are supported. My Bad. Adobe Digital Editions does recognize the Vox! We noticed this doing our ebook loading and library borrowing tutorials. Have you loaded overdrive? I think access to the public library system is a big plus. Have you been able to load google books? This may turn out to be the most flexible reading device yet, outside of a full featured tablet. I would however categorize this device as ‘allowing’ open access to content rather than ’embracing’ open access to content. I can’t see the average consumer going to multiple app stores just to build a fully open experience. I assume that most people use the app store installed on the device. In the end, it’s not a ‘walled garden’ but the fence around the property is too high for the average consumer to climb over. As a more technically skilled consumer I think I’m really going to enjoy owning this device. Fine work! We added Google Books and Overdrive to the main list. Are you sure? Digital Editions did not recognize my Vox over the weekend, Kobo told me today the Vox doesn’t supoort DE. Can you guys clarify, please? If you do, please post approach. I want a OneNote variant for Android called MobileNoter, and it’s not one of the approved apps for Kobo. Annoying. Has anyone found an instapaper client that works on kobo vox? It works just fine with Digial Editions for me. My first Vox — returned for other glitches — wasn’t recognized by Digital Editions (or the Sony Reader Library software) as an ereader. Hopefully the replacement I’m picking up today will be (and won’t have the other glitches). Love the device, just want it to work (and have access to apps outside of the odd list Kobo has put together). If you download the kindle app from amazon… will kindle books snyc bewtween the vox and a kindle keyboard? Many of these apps won’t let me install them because it keeps telling me I don’t have an actual Android device. 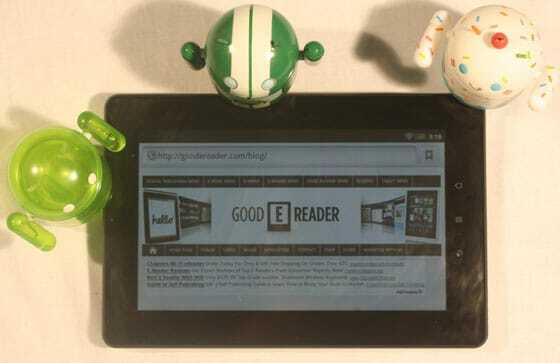 This Kobo is the only Android device I own. I really need to be able to read DRM protected files. Any advice would be appreciated. Thanks! The OS and other built in apps take up space, its normal to say a unit has X space but in reality it ships with less. Here is what I do because I have similar programs and am running Windows 7. Plug your Vox in and then when the unit is plugged in, there is a mount as USB device option on your e-reader. Click on that. When you click on MY COMPUTER it should be showing up as a removeable device, but you can’t click on it and shows up as unmounted. Click on Start and then LOGOFF, your Windows OS will close and log you off, once thats done, instantly log on again and it should be a quick OS restart. once this is done click on MY COMPUTER again and then it should be recognized as a Vox. Let me know if this works. Had no clue, removed it from the post. I went into the local Chapters last night and successfully downloaded the eReaderPro app onto it which gives me access to my old library without having to resort to Calibre. I was able to pull up my library easy enough. This is the tipping point in the Vox’s favour for me. Now I can have all my books from eReader.com, fictionwise, kobo and kindle on one platform so that I can have a fully functional reader. As soon as the expense cheque is in, I am buying my Vox! I have the Vox in my closet waiting for Christmas. Today I’m scanning all the youtube reveiws and frankly I’m beginning to think I made a mistake. See, I have a Kindle keyboard and I’m concerned how I’m going to integrate my Kindle books with the Vox. I’m not familiar with eReader.com. How will you use it to have kobo and kindle books on the vox? Sorry for confusing you … I won’t be using eReader for my Kindle books. What I will be doing is adding the Apps for Kindle and eReader onto the Vox. I don’t care if I have books spread out in a variety of formats as long as I can open them on the same unit. Right now I am reading off of an iPod Touch and the small screen is getting to me. I love my iPod and don’t want or need an iPad. What I need is an ereader platform that allows me the flexibility of having all my books on one unit. I agree with Mumsews. I was a Sony Reader user and bought books from Sony and Kobo. Now I have the Kobo reader app and the Sony Reader app installed on my Vox and can shift back and forth easily. You’ll just need to install the Kindle app and you’ll be fine. I would suggest you pull the Vox out of your closet, charge it for 4 hours and then make sure it turns on and off easily and has WiFi connectivity. If you have any issues with either of those things, keep replacing it until you’ve got one that works, then put it back in the closet until Xmas. I cant get the gmail app to work on this list. Does anybody have any ideas? Thanks so much for all the tips, I was about to return my Vox, but now it reads books from ADE and I am thrilled with it! Get Aldiko on the vox, and you can read your drm files. Great post, thank you so much! I’ve been trying to access the Goodrads app but haven’t succeeded yet – any advice? Thank you Thank you Thank you. I have spent a week with my Kobo Vox trying to get android apps to download, access epub books from a public library using Adobe Digital Edition with no luck. Installing Overdrive off this sight worked great and now I can download ebooks directly to the Vox – exactly what I was looking for! Keep up the good work! Anyone know if playon.tv app can be installed. Want this for my wife but unless it works with playon i’ll need to get something else. Have to ask about the Astro File Manager…I downloaded it, but declined to install after it asked for permission to be albe to put my vox to sleep whenever it wanted! What’s that all about? And why would I want to give an app that power? is there any legal place to download the Dropbox.apk? – I downloaded the apps from the Android Market on my HTC Desire, then I put them on my computer (using MyAppSharer, but maybe you can use any archive app, I guess), then on a microSD card. – I inserted that microSD card in my Kobo Vox and used Easy Installer (which you can download and install directly on your Kobo Vox from one of the app stores Good e-reader has indicated) to install the apps. – The first thing I did was to install the Dropbox app, so now I can just put the apk files in My Dropbox (from my HTC Desire, on my computer) folder and install the apps directly from the Dropbox folder on the Kobo Vox: it works like a charm! -Also, perhaps installing Adobe Air before the other apps is a good idea (I am note an expert, I dont know). – I installed the Android Market this way : it won’t work because it needs to register the device, and well… I tried! Just wanted to say, I need this tablet to study (distant learning, where all lessons are electronic files), so I need to be able to read them and edit/annotate them and surf the Internet for research. I just did not want to spend hours carrying my laptop or sitting at my desk, as I will spend a lot of time reading). I won’t be using it to take pictures, nor watch movies or whatever, and I will only use it at home (so no 3G is ok for me). I also bought a capacitive stylus at Futureshop (the Futureshop brand), and for the moment, it’s ok! Use the browser to get to the Amazon website then you can download the Kindle App and install it. Very easily done with no special requirements. Can you read on VOX Adobe DRM files? I don’t want to remove the protection, just to have an app that is able to read them? You can use one of the programs we listed “Aldiko” you can import your DRM books into that program and read them within. We are delighted now to be able to use the Kindle store in addition to our Kobo store on our VOX, thanks to your information here. wow!!! Cannot believe Vox would be sent out without ADE working! What would be the point if all you could get were books from Kobo? Not fair, Kobo! This is expensive and it should work properly or not be sold. Great video on Vox & Digital Editions, but doesn’t show where/how to get Digital Editions to actually show up on Vox. Please help! HOW the heck did you get ADE to recognize your Vox? Do you actually make a new bookshelf called KoboVox? It sure doesn’t work on my new Vox and I’m so disappointed! I didn’t read all the comments to see if this was addressed, but when I clicked on the link for the Overdrive app, I got a “page not found” message. We fixed this for you just now. Why would I add “Kobo Books” to the Kobo Vox? Does it offer something that the baked-in Kobo support doesn’t? Thanks for the link to installing Kindle, I’m loving having both Kindle and Kobo on the same device. The link for aldiko doesn’t seem to work now? I can’t seem to find anywhere else I can get it onto my vox. Thanks! Hi! Thanks for this amazing post! With the tips and tricks you have given, I am having a great experience with my Vox. I am having trouble downloading Aldiko. Any advice? Thank-You for these apps! I have been searching and nearly pulling my hair out trying to get the kindle and other amazon apps on my Kobo Vox from Canada. Thank You! Any tips on making the YouTube app work on my vox? I’ve tried, and while I can see the video, when I press play, it spools for a while and then says it can’t be loaded. I’ve tried switching off the HQ option (as per the Kobo website), but that doesn’t work either. Downloaded Overdrive and was able to access books from my public library. But to read them, you must open them in Overdrive, they don’t go into the Kobo Vox bookshelf. Not a real problem, but for some reason I find that a bit disappointing. Is there any way to get Skype on this ereader? Also when downloading books directly from the internet, I am finding it problematic as I am always getting ‘download unsuccessful’ message? Please advise, maybe due to the fact the Vox ereader doesn’t support PDF files? I’m trying to get Astro Bluetooth module to enable with Astro File Manager on my vox and am having no luck, I even tried enabling it with a separate app manager and still nothing. Tried 4 different apks, it doesn’t seem to wark anyone have any ideas? Have there been any solutions for this problem for those people who live in Canada? I’m having the same problem in that all of the essential installs and app markets can’t be downloaded. If anyone could help that would be great. Are there applications such as word doc that I can install fro reading and editing and creating new documents? I have watched your video on Calibre and ADE and have downloaded both onto my computer. When I connect my Kobo Vox to my PC neither program recognizes the Kobo Vox device. I have transferred the ePub files to the Vox directory but am still unable to view them on the Vox but am able to see they are on the directory. Not sure what I am or have done wrong. I have downloaded Calibre and Adobe Digital Editions onto my computer, and managed to convert kindle books to epub. Tried to put the books onto my Vox – could see them in the computer but still couldn’t see my epubs on my Vox. Downloaded Overdrive onto my Vox and am still not seeing my books. What am I doing wrong? I am having the same problem, have you found a fix yet? I cant download flash player on my kobo vox also not able to use amazon apps either.. so frustrating! What about Java? I am trying to view a webpagw which on my deskto requires java, but cannot view it on my vox. Also, i use ez pdf reader from amazon apps, and love it! It was only 99cents, and keeps the embedded links live. I have “dragged and dropped” a MOBI format book on my Kobo Vox but cannot figure out how to open it. Does it need to be in a specific folder? Same question for transferring music (.mp3) . Thanks. I don’t know why, I can’t install Adobe Digital Editions on my computer. Please, somebody help me. Is there anything I can do to play ‘Words with friends’ on Facebook? I thought it just needed flashplayer, which I tried to install, but I’m not sure it’s actually been accepted by my Vox (I heard they weren’t compatable. I was so excited to figure out how to get my library books, using Overdrive – and a few other apps I downloaded at your app store — but now my Vox is glitching. I don’t know if it’s just cooincidence. It turns off when sitting too long (noot just falling aslleep) and is SO difficult to turn on. Kobo told me to reset it to factory settings,but that I’d lose all my apps. Do you know if I can first save everythingto my computer, with the USB cord, or to the sd memory card I put iin it? Kobo just told me that flashplayer isn’t compatable with the Vox, yet it’s on the list of suggested apps…. is thrre a way around this? I purchased an ebook on Kobo (i have an Kobo Vox) but the book isn’t able to import into Kobo Vox. Therefore I contacted Kobo Help. They asked me to download a PDF viewer onto the Vox. Now if anyone could recommend me the app for it and also how to get the e-book onto that app…I’ve tried a couple of things but no luck…The only i am to view the book is on the adobe digital editions on my laptop…but am having trouble viewing it on my Kobo. PLEASE HELP!!!! I’m going crazy with this thing!! I am trying to transfer files from my laptop to my kobo vox. I have converted the files to epub format and when i go into ‘computer’ and then ‘kobovox’ the files are all listed there, but i can’t actually find then on the device itself! Where are they stored?? apps? library? downloads? they are NO WHERE!!!! Please help me. click on library and then the menu button (the horizontal lines). then “import content.” the books will load, very slowwwwly, into your library. took me a few days and many google searches to figure this out. brings up face book, when I tap on contacts it brings contacts up etc. etc. no apparent reason. Should this happen? Does Google Play Marketplace work with kobo vox and if it does how do we get it? Im looking as to how to download the adobe air for my kobo vox using the vox its self. Any ideas as to how to get it that way? Thank you in advance for your help. You could try Aldiko Reader and Mantano Reader. They are both free apps for pdf reading and work very nicely. I like Foxit reader but don’t know if it is compatible with KOBO Vox. did you get any useful relies to this? I have a funny feeling vox wont work with ADE or Calibre, which is pointless. how do i get the google play store app on my kobo vox?